Glaucoma is a serious condition that can majorly inhibit quality of life.Although surgery was the traditional treatment, more and more are turning to cannabis for the answer, so what is going on? You may have heard that cannabis is able to help treat the symptoms of glaucoma. It has been effectively used for the purpose for a long time, even though there are still doctors who question its potential. What are their reasons for it? Is smoking joints for the rest of your life the answer to your glaucoma condition? Glaucoma is a group of eye diseases which can damage the nerve responsible for carrying visual information to the brain. If left untreated this information does not reach your brain, leading to blindness. In order to keep in place and maintain its spherical shape, your eye needs to maintain an adequate pressure level, which is done by balancing fluid production and drainage. Whenever the production rate of this fluid exceeds that of its drainage, there is fluid accumulation leading to an increase in the intraocular pressure (IOP). The result of this increased pressure is a compression of the eye, which damages the blood vessels and nerve fibres. This is the main cause of Glaucoma. 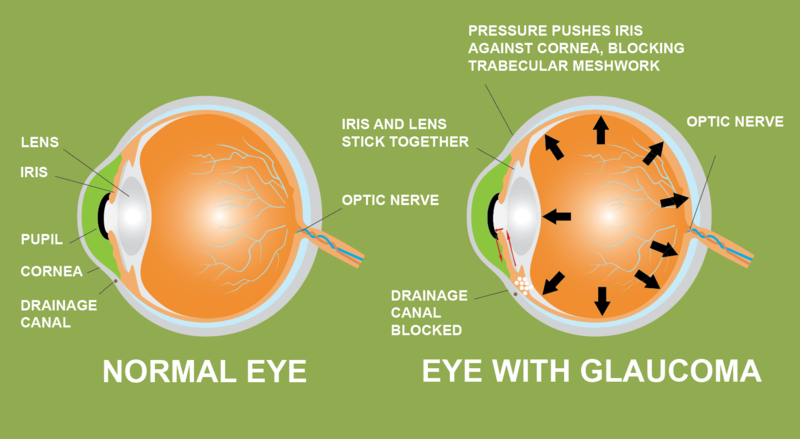 There are two main types of Glaucoma: Open-Angle and Closed-Angle Glaucoma. The former occurs when the fluid is unable to leave the eye at the tissue responsible for draining it, leading to fluid accumulation. In the latter, the fluid passage is blocked even before reaching the drainage area, due to a narrow distance between the lens and the iris. In case the two get in contact, the fluid may be completely unable to pass, leading to a quick pressure increase – a very serious condition. Since there is no current cure, patients need to resort to medication or surgery, which are not permanent solutions and carry risks. The current strategy to treat Glaucoma consists of lowering the ocular pressure, which cannabis has been shown to be able to do so. This is thought to be because of the high concentration of CB1-type cannabinoid receptors in locations responsible for fluid production and excretion, leading to an improved outflow and decreased inflow of eye liquid when activated. Cannabis can protect your neurons! Another way cannabis can improve Glaucoma is by preventing neurone cell death. This is because cannabis can inhibit the release of a molecule called glutamate. Glutamate influences the way your neurones fire, and its accumulation can lead to neuronal damage. Glaucoma sufferers tend to have an elevated level of glutamate, and thus, cannabis could effectively protect your neurones under this condition. Will using cannabis prevent my glaucoma progress? Using cannabis is thought to delay the progress of glaucoma by temporarily easing symptoms. However, the effect will only last about 3 hours, after which you will need to use again. As it stands, it makes cannabis slightly impractical, but for those willing to use as such, it can offer much-needed relief. Smoking Cannabis is not the only method for getting cannabinoids into your body. Alternatives include vaporization, ingestion and topical. Moreover, the Cannabis plant has over 100 cannabinoids with various effects and synergetic properties. This means that the effects may vary according to the cannabinoid profile of each strain (or even each batch). Vaporization or ingestion could constitute an improvement over smoking because they avoid the toxic by-products of combustion, which for long-term use can be imperative health-wise. For a more localised effect to treat Glaucoma, topical administration (such as eye drops) is an exciting solution because it can reduce the probability of other cannabinoid receptors throughout the body being activated, leading to potentially unwanted side-effects. Cannabis has long been used to relief Glaucoma, and the discovery of several cannabinoid receptors in the tissues responsible for maintaining the eye pressure, constitutes exciting news about the plant potential. At the end of the day, it all comes down to personal preference. Much more research is needed to fully assess just how useful cannabis is in fighting glaucoma, and the best ways to administer it. One thing is certain, though, cannabis holds potential.